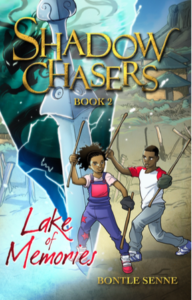 Lake of Memories is the second book in the Shadow Chasers trilogy. It’s a fantasy adventure ̶ one part family saga, one part hero’s quest. Zithembe has to find his knife to rescue his mother from the evil Army of Shadows. The only way to find it is to go to the Lake of Memories in the dream world, where it guarded by the evil Mami Wata water spirits. Without a knife of his own, Zithembe can’t go to the dream world, so his friend Nom and his cousin Rosy have to take their lives in their hands to help him …. “ Deliciously creepy, fast, fun and a blast to read. Get this for the reluctant reader in your life right now!”- Sarah Lotz, SA novelist, Her latest solo novel, The Three, will be published in the U.K by Hodder in May 2014 and by Little, Brown in the U.S.